The material and energetic utilization of biomass can contribute towards covering the worldwide raw materials and energy supply needs. In addition, it reduces the emission of gases harmful to the climate, diversifies the raw materials supply and stabilizes it long-term. From June 18 to 22, Fraunhofer UMSICHT is exhibiting the Innovation Cluster Bioenergy at the Achema 2012. Its objective is to develop new utilization concepts for dry and wet biomass as well as biomass containing lignocellulose. The exhibit is located at Hall 9.2, Booth D64. 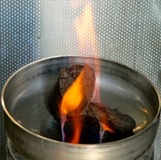 Pyrolysis oil is obtained by pyrolysis of biomass. Pelleted biocoal has a similar calorific value of fossil coal. Worldwide, immense amounts of fresh biomass are generated. The spectrum ranges from grass and green waste via harvesting residues, processing scraps from agricultural and forestal production to biowastes from private households. To date, wet biomass is utilized less intensely. Because the high water content results in a low calorific value and makes transport and storage more expensive. In addition, the inhomogeneity, ash content and bad processability of wet biomass make its utilization more difficult. At the Achema 2012, Fraunhofer UMSICHT is presenting the Innovation Cluster Bioenergy, an endeavor for material and energetic utilization of wet biomass intended to tap into the opportunities for improvement with respect to collection, transport, storage and process flow. The goal is to provide technologies that can be utilized in a mobile and decentralized manner to manufacture intermediate products worth storing and transporting from biomass that contains lignocellulose and/or is wet. Specifically, ablative flash pyrolysis and hydrothermal carbonization are planned in the project since the product as generated in these processes as well as, where applicable, their mixtures represent interesting intermediate products and/or raw materials rich in hydrocarbons for energy supplier, petrochemistry, chemistry and biotechnology. New utilization concepts for biomass are presented as an alternative to known technologies such as the utilization as biogas, bioethanol or biodiesel. For the pre-treatment of wet biomass, technologies for the mobile dehydration of wet biomass and for press juice fractioning are to be developed based on press and membrane technologies. For decentralized biomass processing, a technology for the mobile production of bio raw oil close to harvesting is to be developed based on thermochemical conversion, a.k.a. pyrolysis. For semi-decentralized biomass processing, a technology for stationary utilization of wet biomass and/or residues is to be developed based on hydrothermal carbonization (). The Innovation Cluster Bioenergy is fincanced by the German state of North Rhine-Westphalia () and the Fraunhofer-Gesellschaft at a combined total of 50 percent. The overall project value amounts to approx. 8 million euros over a period of 4 years (until the end of 2015). Fraunhofer UMSICHT is presenting the Innocluster Bioenergy June 18-22 in Hall 9.2, Booth D64 at the Achema 2012 in Frankfurt am Main, Germany.